There’s something quietly amusing about us doing a sports themed manga. Mostly because neither Tim or Weltall are involved in any sports. They also don’t watch or follow any particular teams. Yet they’ve reviewed a manga for most major and a lot of lesser watched sports. From football to foreign football, tennis, shot put, boxing and who knows what else. We add yet another to the list in the form of a bicycling manwha, Wind Breaker. Our man character is an upstanding student, the class president, and the son of a doctor. Would you believe his father is putting a lot of pressure on him to succeed? Meanwhile he has a passion for bicycling and gets talked into doing a single race against a member of the local biking club. Tim liked it well enough to give it a Crackers. Weltall then finally gets around to a hard copy submitted via post by pony express. The poor man had been shot riding across the Oklahoma territory but managed to drop his parcel at the nearest Western Union. 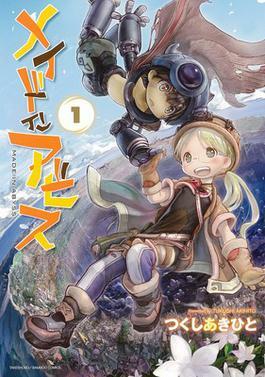 Weltall wiped the blood stains off and proceeds to review the creepy loli manga that is Made in Abyss. It’s about an abyss that goes who knows how deep and is full of artifacts ever body wants. The deeper people go, the harder it is to return so naturally our main characters head down in search of someone. It gets a tentative Read It Now. Can someone clip Weltall from long ago with weltall talking about this manga. I nominate you. Get clipping! Ay, you’ve started reading Made in Abyss. Good on ya, love that story. Think you’ll cover more of it in the future as you get further (deeper?) into the manga? As for my two cents on the sexualized child art debacle thing: As long as it’s fictional and no child was involved people can draw whatever the hell they want as far as I’m concerned. I might not care for it or even outright find it unpleasant, but that doesn’t mean it shouldn’t be done. First off 1 gear, roadbikes are a thing at least in the UK as well. I road them for a good portion of my uni years. It’s a 1 to 1 thing where the pedals are directly moving the wheels which is why you can lock your legs to slow down instead of doing breaks. It is possible to do this for skidding and tricks but it’s bad for the tyres. If you ever wanna check out a golf manga, I’d like to suggest Robot X Laserbeam. I also agree with Crooh on the art debacle thing. Age ratings to me are the only reasonable levels of regulations I can get behind but not flat out banning. There’s plenty of art I find distasteful but I’d never infringe on someones right to make it unless involves real abuse. At it’s core it comes down to how highly you regard creative expression and personal freedom.